Work is a huge part of adulthood and we spend up to 60% of our waking hours at work, therefore work is a key place to encourage change to habits and routines. Improving health and increasing physical activity levels is good for both employees and employers. The Workplace Challenge is a great way to get workplaces physically active and it's free to sign up. Use the activity log to record your levels of sport, physical activity and active travel online whilst competing with other workplaces. Log activities all year round and take part in challenges throughout the year to be in with a chance of winning a prize. Sign up to the Derbyshire Workplace Challenge here. Why is workplace health important? Staff ill health has cost implications for businesses through loss of production, early retirement, staff turnover and absenteeism (both through long term sick pay and the cost of temporary staff). Back pain is the most common cause of sickness absence from work in the UK, at a cost to industry of £5.7 billion each year. Work related stress, depression and anxiety form the second most common reasons for work related sickness absence, costing the UK economy between £3.7 and £7 billion each year. Walking meetings help increase physical activity during your working day. create a positive corporate image. For more information visit the Healthy Working Lives website. The Workplace Challenge - a national programme that aims to engage workplaces in sport and physical activity. Users can log their levels of activity whilst competing against other workplaces, friends and colleagues at the same time. Top tips on workplace activity - ideas to help workplaces become more physically active. 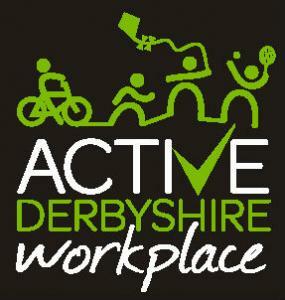 The Healthy Workplaces Derbyshire programme - offers workplaces information and tools to help create a healthy workplace. Success stories - stories from workplaces in Derbyshire that highlight the benefits of physical activity for both employees and employers. Sport offers for your workplace - get ideas on what sports your workplace can get involved in and how to get started. 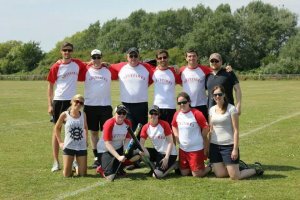 There are loads of different sport offers that your workplace can get involved with whether it's a lunch time running group or a rounders tournament to bring everyone together over the summer. Click on one of these sports to find out what is on offer and how your workplace can get involved: badminton, basketball, canoeing, cricket, football, golf, nordic walking, rounders, running, softball, squash, swimming, table tennis, touch rugby league, volleyball and tennis. Badminton is a fast, dynamic Olympic sport and caters for all ages and ability levels. Whatever your reason for playing, be it fitness, health, to compete or just for fun…it's easy to book a court and get playing at your local leisure centre but to make it even easier here are some more great ways to play more often. Get back into Basketball or try it for the first time with 'Ball Again', a programme that offers coaching and games to reintroduce people to the sport or those wanting to try for the first time. Visit www.ballagain.co.uk for more details. Basketball England offer Activator courses to train up people to help coordinate and run activity, perfect for workplaces! Visit www.basketballengland.co.uk for more details. Canoeing is a fantastic sport that is accessible to almost anybody irrespective of their age, ability or fitness. It also encompasses a range of different disciplines which means it can be as competitive, exhilarating, relaxing, challenging or fun as you want it to be. It can offer team bonding, healthy competition and stress busting opportunities. Last Man Stands (LMS) Cricket is a great, quick social 8-a-side T20 cricket game that is easy to join. Groups of work colleagues can get together and enjoy a competitive game of cricket after work. There are local organisers for LMS in Derbyshire ready to help workplaces to organise their teams and get playing. 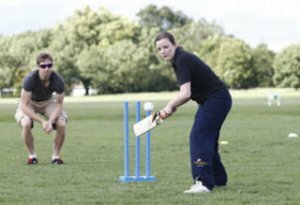 Easy Cricket is all about getting people involved in informal games of cricket in a fun, engaging way. Games can be played during your lunch break or after work and is delivered by Cricket Activators who are supported with a 'how to' guide with lots of ideas on what to do in sessions. The FA Mars Just Play! gives the casual footballer a chance to just turn up to a venue and play football. The Just Play kickabout is recreational football at its best – it's about turning up for an hour of exercise and a bit of fun. Looking for a new challenge? Want to get healthy and active? Keen to meet more friends or spend quality time with your partner and wondering what to do? Golf offers all these benefits and more. It's such an adaptable game that it suits everyone, whatever their age, fitness level or ability. Whether you want to keep healthy, burn calories or spend time with friends, golf is for you. You can get started by taking advantage of the beginner courses on offer from Get into Golf across Derbyshire. You'll receive a basic introduction to the game from a PGA professional together with information about follow-on coaching opportunities and club membership. Equipment will be provided so all you have to do is turn up on the day in comfortable clothing, before you know it you will be out on the course playing golf. To get started just visit www.getintogolf.org find and book an activity or call 0800 118 2766. The Get into golf campaign run by England Golf and supported by Sport England National Lottery funding, making easier than ever before to get started. Nordic Walking is the perfect lunchtime workout because it works the whole body and leaves you feeling energised and refreshed. All you need to change are your shoes and then you can join your colleagues for an effective, sociable and fun way to get in shape…fast! With its quick, simple but competitive nature, rounders presents the perfect antidote for people looking for pure escapism. It's also a great way of developing strong team bonds among co-workers. For more details on how your workplace can get started click on the link below. 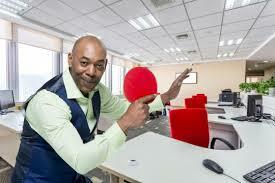 Introducing table tennis into your workplace is a great way to improve health and wellbeing amongst staff. It is shown to increase social interaction and cross-departmental relationships (for the benefits of both work and pleasure) and table tennis has a great knack for involving and engaging people who are normally happier to reside inside their shells or shy away from sport or physical activity. 'Beat the Boss' packages are available to workplaces and include tables, bats, balls, trophies and everything else that you'll need to get your colleagues around the table. Touch Rugby League is a fast-paced, minimal-contact version of the game that is for all ages, sizes and abilities to take part. Touch Rugby League is a great alternative to the gym - participants can have fun getting fit whilst enjoying the excitement and camaraderie of the traditional game but without high impact tackling. Go Spike is Volleyball England's campaign to increase the number of individuals participating in recreational volleyball. It provides individuals off all ages and abilities the opportunity to experience volleyball in a social environment. Go Spike can be played anywhere at any time – indoors, on grass or on the beach. Local Tennis Leagues (LTL) was set up to make it easy for adults of all standards to play friendly, competitive matches on local public courts. LTL helps build supportive and friendly tennis communities that give people the opportunity to play matches.